It's been a long time since I've taken part in What We're Reading Wednesday, but I have been reading! 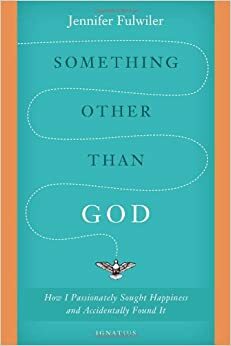 In the spring, everyone was talking about Jennifer Fulwiler's book, Something Other Than God. I had to miss the initially rush because I don't buy books and wait for the library to get it in. Thankfully Notre Dame decided to buy the book, so my wait was pretty short. I enjoyed the book and found it engaging. I didn't necessarily find it compelling for why I'd want to become Catholic. But as someone's personal conversion story, it was good, maybe 4-star good. 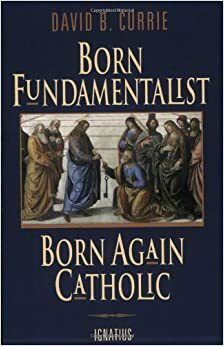 But it did get me thinking and so I checked out a book that was helpful when I first started considering Catholicism many many years ago - Born Fundamentalist, Born Again Catholic. Although I'm not a fundamentalist, much of the book speaks directly to issues that I have in considering the Catholic church. Currie writes for the protestant reader, so his arguments are straightforward and use language that is familiar to protestants. His arguments are also very well researched and laid out. Although the book does tell his conversion story, it is not really a personal story. It is based upon intellectual discoveries. Each chapter addresses a different area of Catholic doctrine that protestants (specifically fundamentalists) have disagreements with. Currie starts with Communion and the Real Presence. I've always had the sense that Catholics have it right when it comes to the Eucharist, so this chapter is a good refresher of why that is so, focusing on the scriptural evidence. His next chapter deals with the idea of "sola scriptura" and how that itself is not scriptural. He makes a convincing argument against it, which sets the stage for arguing the rest of the points in the book. Of all the conversion literature I have read, this is by far my favorite and the most convincing. Since I was enjoying this genre of conversion stories, I decided to get a Scott Hahn book next since he is pretty much the spokesperson for protestants becoming Catholic. 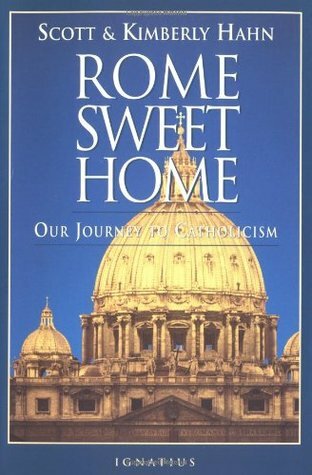 I picked up Rome Sweet Home. My feeling about this book was just "meh". I disliked the way it was written with back and forth between Scott and Kimberly. Although I appreciated getting both of their stories, I thought it made the story more difficult to follow and sometimes things were repeated without adding any additional insights. Also, I just didn't think Scott and Kimberly did as good of a job explaining their reasoning as Currie did. Now I know the Hahns have many more books, so perhaps in the future I'll give a different one a try. Hi! I found your blog through the linkup. I love conversion stories, but I haven't been able to read Something Other Than God yet. I had a similar reaction as yours to Rome Sweet Home. But I found that Hahn is a wonderful speaker; I really enjoyed some videos of his talks on youtube, especially on the Eucharist. I've never seen his videos. I'll have to check that out! Might I recommend Chris Haw's book "From Willow Creek to Sacred Heart"? :) It's his own conversion story and speaks to probably many of the concerns you have with the Catholic Church. Cassie, I have read that! Read it last summer right after meeting y'all! I liked it, but it made me yearn for a Catholic church like Sacred Heart! I'm glad you liked Born Again Catholic! Mr. Currie spoke at my son's high school graduation this past May, one of his son's was in my son's class. His son was also the salutatorian. The Curries have a lot of kids and they are all brilliant. My son would have gotten "Most Suspensions" for his class if that was an award. I haven't read any books by the Hahns, but I keep hearing good things about The Lamb's Supper. Picked up Lamb's Supper at the library today! Have you heard of Lighthouse Catholic Media? They provide, at low cost (a donation, actually), audio CDs featuring talks by Catholic authors, priests, etc. You may be interested in obtaining one of the Scott Hahn CDs. He is a good speaker.